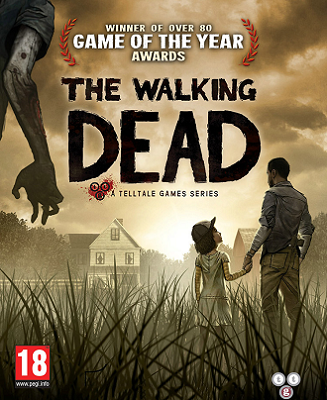 ONE game was all the rage of 2012, The Walking Dead. But, let’s be honest here, I’m always a step behind when it comes to games. 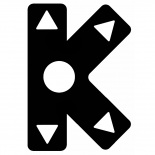 But when I saw it as part of a Humble Bundle, I knew I had to get it. I love story-driven games, so I knew this would be a treat. 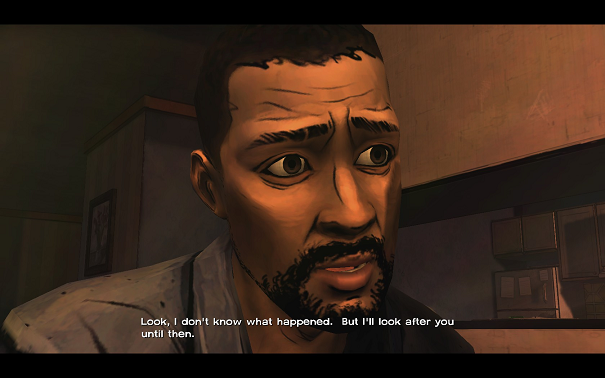 Initially, I was quite surprised with The Walking Dead’s success, as Telltale Games had been known for mostly mediocre products until that point. Not to mention it came out at a point where most people were FREAKING TIRED of zombies. But a good game is a good game, and a powerful story can move people even if the premise is the most trite and worn-out one. It’ll be hard to review The Walking Dead because it’s hard to highlight its strengths while also avoiding spoilers as much as possible… But I’m not one to back down from such a challenge, so here I go. 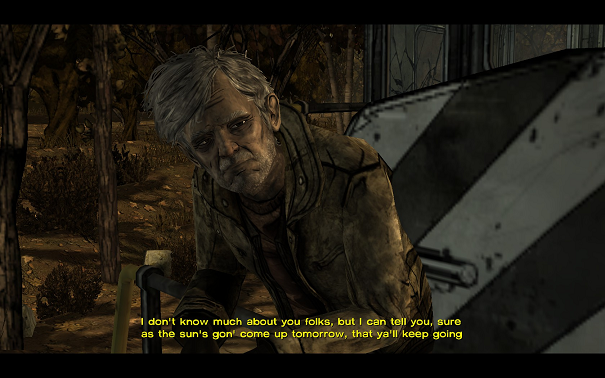 The Walking Dead is an emotional rollercoaster… It’s an adventure game, and thus not something that’ll test your reflexes or other gaming skills much, but the story and characters are top-notch. In a dark world overrun by the undead, you and your group must find a way to survive. Cooperation is crucial, but gaining trust in such a situation is not easy. You’ll often also be faced with choices that sacrifice something to gain another. One of the great approaches of the game is that your responses and decisions are time-critical, so any hesitation could cost you dearly. Most importantly, the many, many choices you’ll be able to make truly affect the story in very tangible ways, I’d say even more so than another recent example of this mechanic, Mass Effect. Screenshots in the review have been taken by me. The two then meet other people and form a group with them, a group as volatile as the world around them, with each and every member driven to the edge by the apocaliptic circumstances. They need to find food, water and other necessary resources, they need to have a stable shelter that can keep them safe not just from the zombies, but also hostile humans who are willing to use force to get their hands on those resources. 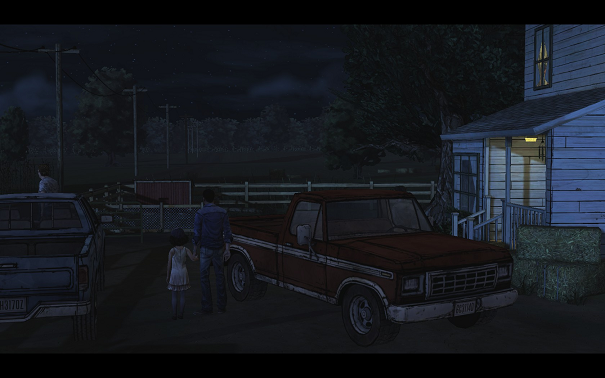 Humanity is on the backburner, the world being pretty much reduced to “survival of the fittest”… And, based on your decisions, Lee can either go along with it, or try to keep whatever humanity is left within him, while setting an example for Clem. You can imagine the many twists and turns the story takes from then on, the paranoia and sheer uncertainty whether you can trust the other members of the group. The constant threat the undead, as well as other humans pose will keep you on the edge of your seat. The heavy decisions the game leaves to you can often make the difference between life and death. There are countless emotional moments through all five chapters, and, sometimes, you’ll probably even stop for a break yourself to think about what just happened. The DLC called “400 Days” is independent from the game and offers the short stories of five characters unrelated to Lee at various points in the first 400 days after the breakout. The cast is The Walking Dead’s strongest point, as the desperate situation brings out the best, and worst, out of the people involved. It’s just inevitable, and the writers have done a good job creating realistic characters who act human. There are no foolishly brave ones, much less superheroes, everyone’s afraid of the zombies and avoiding the undead is always preferable to fighting them. Of course, the main character, Lee, shines the most, though it’s mostly up to you to define the kind of personality he has. 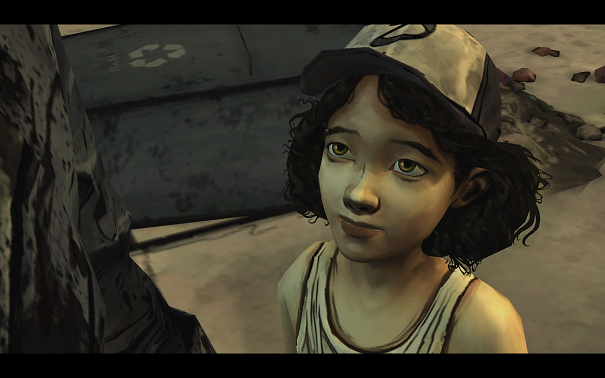 Still, taking care of little Clem quickly becomes his priority, his top objective in the game, and everything else is more or less done to ensure her survival and future in these dire circumstances. Lee may be a felon, but he used to be a university professor, and he’s intelligent and well capable of showing compassion and resolving conflicts. He’s also a capable fighter. Of course, it’s up to the player to take advantage of all that. Clementine is another star in the cast. She seems like just a helpless little girl at first, but you’ll soon find out that, even though she’s little and, like most children, can get scared easily, she can be quite helpful in various situations, and makes her contribution to the group. Her honesty and friendliness make her incredibly likable, and that certainly helps you get even more in Lee’s shoes, wishing just the best for her and working to ensure it. Even the items associated with her – her hat and her walking-talkie, will become quite precious to you. Other characters in Lee’s group are truly all over the place… Some are trustworthy allies, others are hostile, then some are simply scared, confused, willing to do whatever it takes to survive. You’ll probably feel some connection with ALL characters in your group, though that naturally doesn’t mean you’ll like them all. In fact, I’m quite sure some of them will irritate you. But it’s a situation of survival, and an extended one with no hope in sight, either. One can’t expect everyone, most people, or, really, even more than a small handful to act anywhere close to perfectly. Still, as a group, they are generally willing to work together and ensure their survival… Although many have differring visions of that. My favourites in Lee’s group are Omid, a generally funny guy, Mark, a trustworthy partner, and Chuck, a homeless guy with a love for whiskey and a lot of conventional wisdom. As for the characters opposing Lee and his group… There is no single, defined villain in the game (of course, it’s still Season 1, and it’s not unlikely one will appear at some point). Of course, there are the zombies, who don’t really think on their own, acting simply on an instinct to kill and eat all alive humans. But there are also groups of people who want as many resources as they can get, and willing to kill other living humans for that purpose. You will encounter vicious, bloodthirsty, downright psychopatic people driven to the very edge and beyond by the world around them. And you’ll need to fight for your life against them, on more than one occasion. That’s just how it is in The Walking Dead world. 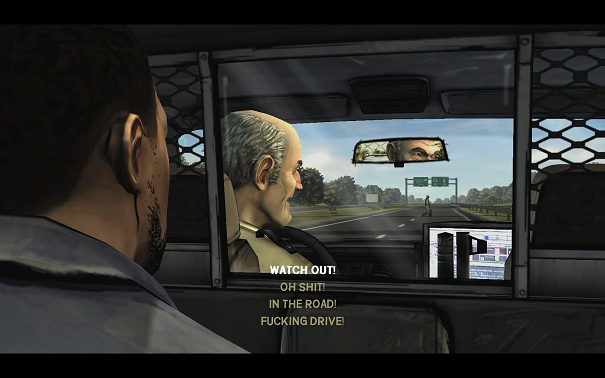 The Walking Dead’s gameplay is quite typical for an adventure game. It consists of two main aspects – locating and using items, and making decisions. There are, of course, occasional fights and other physical actions, like jumping and climbing, but they’re done by quick-time events and/or by clicking the appropriate areas on the screen. In general, the decision-making is by far the most important aspect of the game, and it will determine the way the story unfolds. There are truly quite a few important decisions that make the story take one path or another, and, at first, that seems like a really vast array of options available to the player. As things go on and as you reload a few times to try and change the outcome of something, though, you’ll realise that this is merely the “illusion of choice” we’ve already seen in Mass Effect, and the truly BIG events in the game are very much outside your control. Still, I’d rate The Walking Dead’s choice aspect a bit higher than Mass Effect’s, and I have to say this is really a good direction to take, but, call me a never satisfied gamer if you want, I’d like more. Because this is such a tease – it’s like giving your child the remote of your TV with those 30 fascinating buttons on it, only for him to ultimately, after much pushing, find out that all he can do is switch between the 5 kids’ channels because you locked out all the others. As I said, the best part about choices is that they usually need to be made quickly. A timer’s decreasing rapidly and you need to make your response/decision/action before it’s run out, otherwise you’re “rewarded” with inaction/silence, which usually does not lead to a very good or desired outcome. Although, in many cases, silence is a valid response, and I used it several times in my playthrough. A good general recommendation would be to never be in a hurry to advance the story, as there’s usually quite a bit to talk about with your companions, so that you can get to know them better. There are a couple of options you can choose between in the beginning, and you can change them at any time – it’s whether to get hints during the story, and whether to show items of interest’s locations. I recommend to uncheck the former and use the latter, as it doesn’t really make the game any easier, it just eliminates potential frustration when you miss the “hitbox” of something. 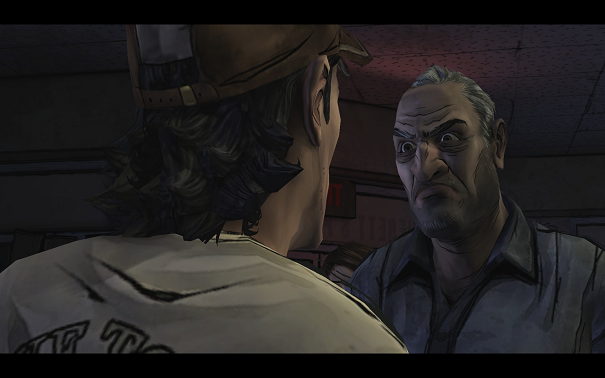 The art style is another very strong point of The Walking Dead. It’s a comic-book style, everything is quite nicely drawn and generally beautiful. 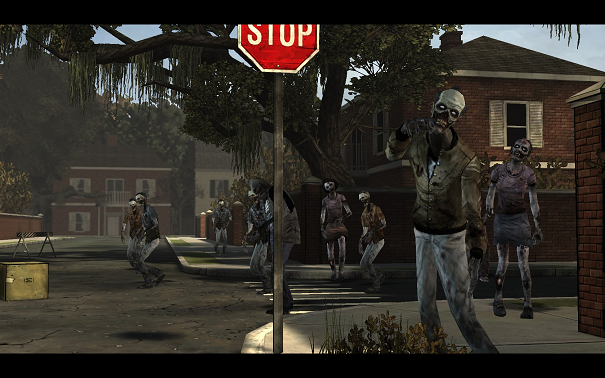 Still, don’t expect much of the environments, as a large part of the game takes place in cities, which have been generally wasted by the zombies and living humans looking for shelter. The ruined world that once used to be reality as we know it will really have an emotional impact on you. Characters, especially their faces, are quite distinctive, with some features slightly exaggerated to give them more of a personality. 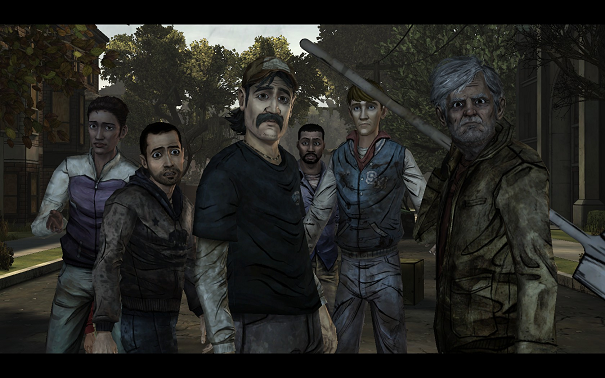 You’ll surely remember Clem’s eyes, Larry’s scowl, Kenny’s moustache… The animations are also quite well-made. 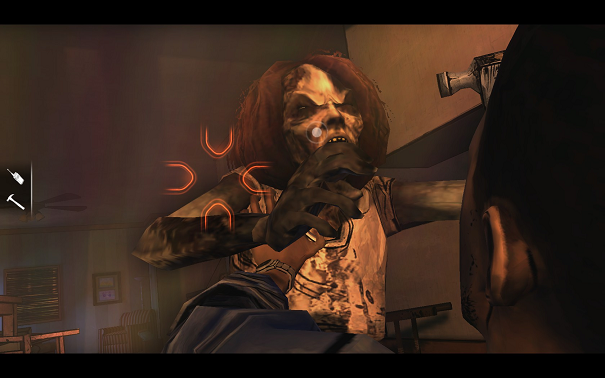 The zombies’ distinctive movements also give them a kind of a personality. 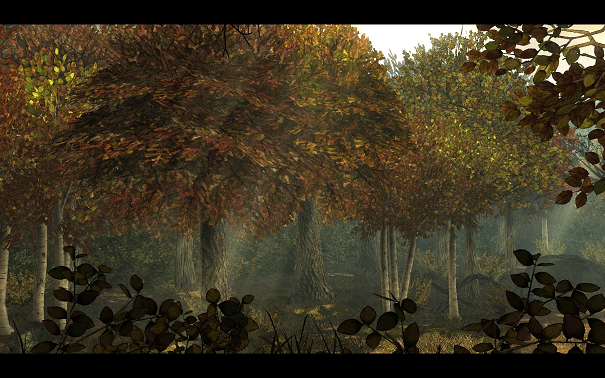 As for the music, it’s mostly atmospheric, fitting the game nicely, but never really standing out. Still, composer Jared Emerson-Johnson created some nice tunes, and the one I’m sharing with you is called “Spirit Healing”. 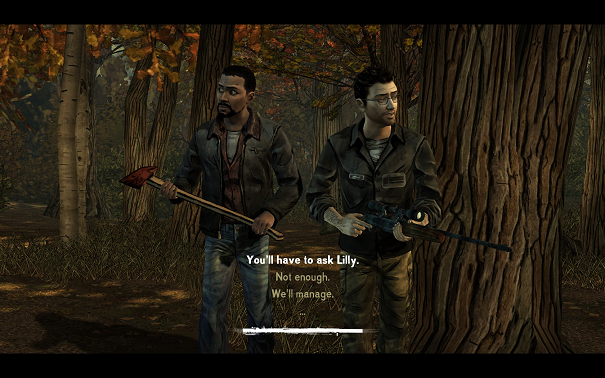 “Illusion of choice” or not, The Walking Dead is an achievement in modern video game storytelling. There’s a reason why this game has won over 80 Game of the Year awards… It’s just really good. The choices you make actually affect the way the story unfolds, even if you can’t change the main plot points. Perhaps that is the price to pay in order to have a somewhat coherent plot as a whole, I don’t know. I still believe it’s possible to leave even more in the hands of the player. 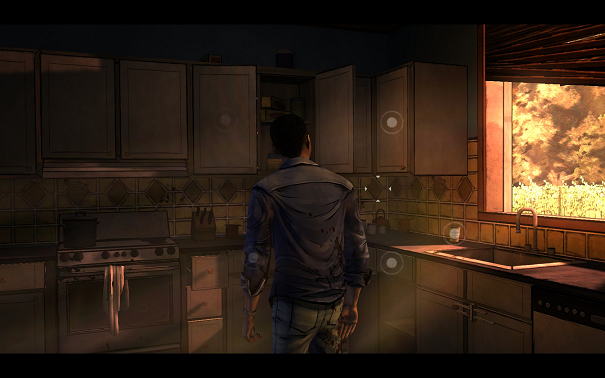 As I said, The Walking Dead still arguably outdoes even Mass Effect in that aspect, so it’s quite powerful, if not all-powerful. The lifelike personalities, interactions and behaviours of the characters in such dire circumstances are particularly impressive, as it’s been generally difficult for video game writers to recreate human behaviour that well. 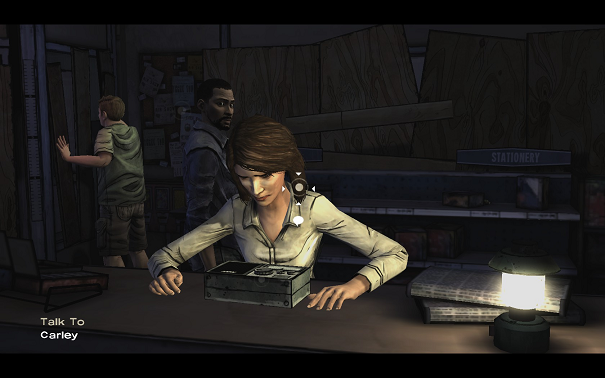 It’s probably the most impressive part of the game, and I find it hard to imagine someone playing and not feeling at least a bit attached to Clementine. The whole game is one big matter of survival, in which you need to face your fears, as there is simply no other way, aside from death. The countless dangerous situations and the necessity to make quick decisions will keep you constantly on your toes, and will provide you with plenty of emotional moments. Regardless, I enjoyed reading through it as always. Couldn’t agree more. It grips you like a tick. I cried my eyes out with that ending.